The demand within the global market for ultra-hard material cutting machine has been rising on account of advancements in the industrial sector. Several new and old technologies are collectively used across industrial units to cut hard materials. The vendors in the global ultra-hard material cutting machine market are making ardent efforts to ensure that their revenue index regularly improves. Furthermore, the vendors have made rational choices with regards to manufacturing and marketing which is projected to bring in key revenues into their kitty. The leading vendors have prioritised customer satisfaction, and have made premium efforts to attract new consumers. It is expected that the lucrative opportunities floating in the global ultra-hard material cutting machine market would soon be capitalised upon by the larger vendors. Moreover, the success of leading vendors has also persuaded newbie entities to enter into the global ultra-hard material cutting machine market. There medium-sized vendors in the global ultra-hard material cutting machine market stand a strong chance of becoming renowned entities in the market. This can be achieved by these vendors through acquisition of smaller vendors and by following the path traced by the larger vendors. Some of the key vendors operating in the global ultra-hard material cutting machine market are Incorporation (The U.S.), OGI Systems Ltd.(Israel), GF Machining Solutions (Switzerland), Coherent Incorporation (The U.S.), and Rollomatic Inc.(The U.S). Transparency Market Research (TMR) predicts that the global ultra-hard material cutting machine market would expand at a healthy CAGR of 10.8% over the period between 2016 and 2024. 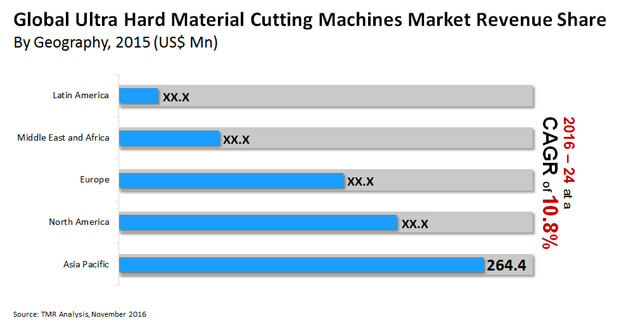 Furthermore, the total worth of the global ultra-hard material cutting machine market is projected to touch US$1.81 bn by 2024-end, rising up from a value of US$730.0 mn in 2015. On the basis of geography, the demand within the market for global ultra-hard material cutting machine in Asia Pacific is expected to increase at a starry rate. The manufacturing sector is a haven of multiple domains wherein a range of products are used. Amongst these, several products and materials fall under the category of ultra-hard materials. Hence, the manufacturing sector has emerged as the most prominent consumer within the global ultra-hard material cutting machine market. Furthermore, the use of metals and ores that harden on being subjected to heat or other chemical processes are also in great demand across several industries. This factor is also prognosticated to bring in voluminous revenues into the global ultra-hard material cutting machine market. Several techniques for cutting hard surfaces, ores, metals, and materials have been developed in recent times. However, no other technique surpasses the effectiveness of laser cutting technologies, and the latter are in tremendous demand across the globe. Hence, the global market for global ultra-hard material cutting machine is expected to expand at the back of growing popularity of laser cutting in multiple industries. The market for global ultra-hard material cutting machine is also expanding alongside greater availability of electrical discharge machines across industrial units and manufacturing outlets.